The process for this project began with a community outreach, programming, and a master plan for the 10-acre site. 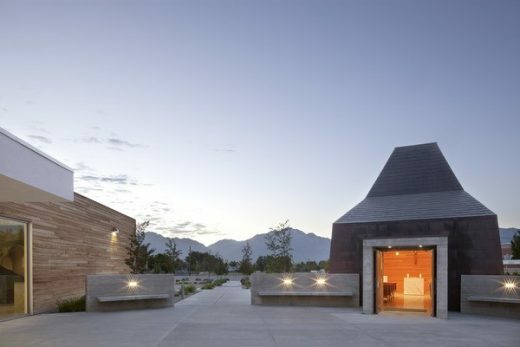 The history of the parish provided inspiration for the new design which incorporated tangible references to the community’s mining and construction past through the use of local materials and hand crafted construction detailing. 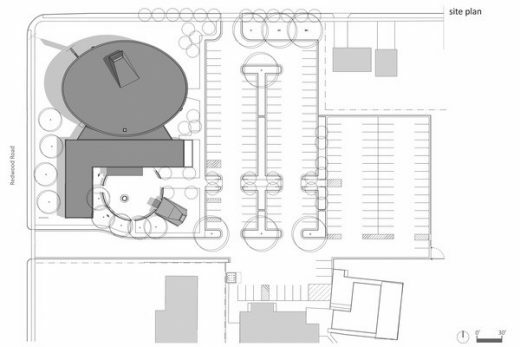 The 23,000 SF plan included a new church with seating for 800, an administrative building with offices and meeting rooms, indoor and outdoor community gathering and fellowship spaces, a large walled courtyard with a central water feature, and landscaped transitional spaces. 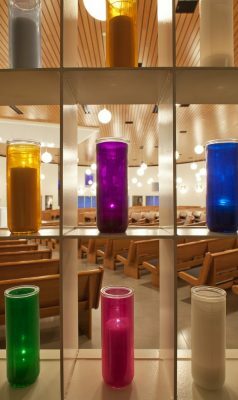 The sanctuary includes colored glass apertures that reference the apostles, large north facing skylight providing natural day-lighting to the altar area, sloping floors with fixed pews, altar and baptismal font of solid stone, niches for religious statuary, reconciliation chapel, and chapel of reservation. 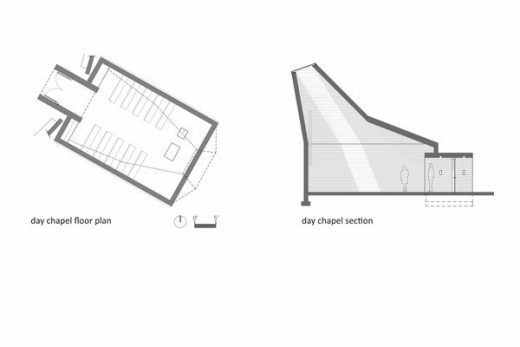 Other elements of the project include, a cry room, hospitality room, a large gathering space connecting to an outdoor courtyard with built-in seating, and access to the separate day chapel. 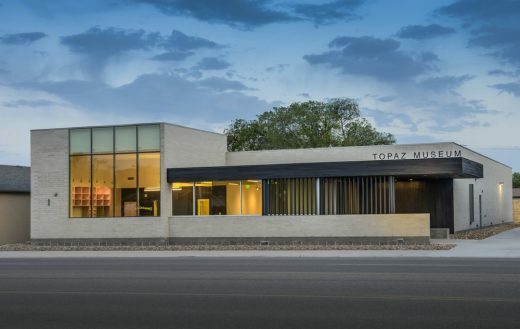 This award winning project was delivered through a CM/GC process to meet the clients budget of $4.5M. Reclaimed materials from the existing church and other sustainable products and systems are integral to the design, both on the interior and exterior. Green aspects of the building and construction process provided the opportunity to demonstrate tangible and natural relationships between social ethics and environmental ethics. 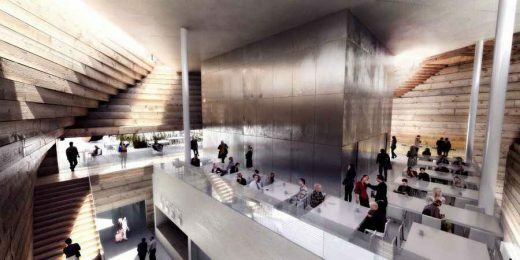 The concrete, for example, contains a high fly ash content and the formwork was re-used. 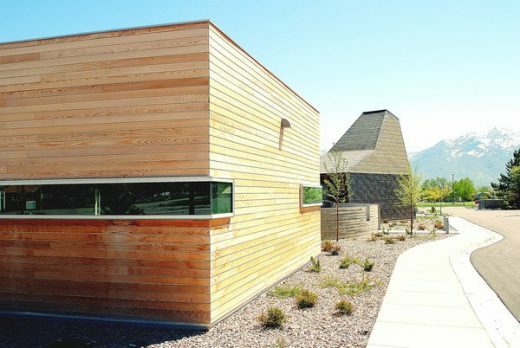 The community benefits from reduced long-term costs associated with operating and main-taining an energy-efficient building. The church is designed to meet a LEED Silver certification. 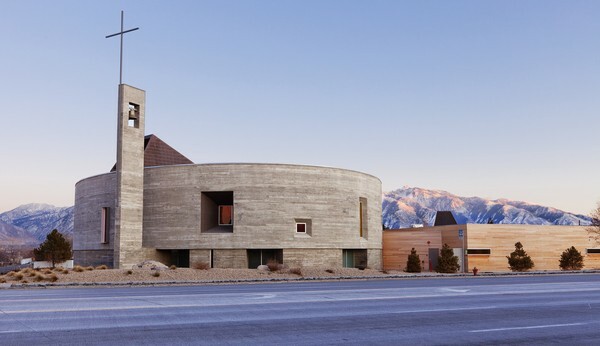 Named for the patron saint of laborers, this parish church has a rich history and cultural lin-eage rooted in the practices of construction trades and craftspeople. 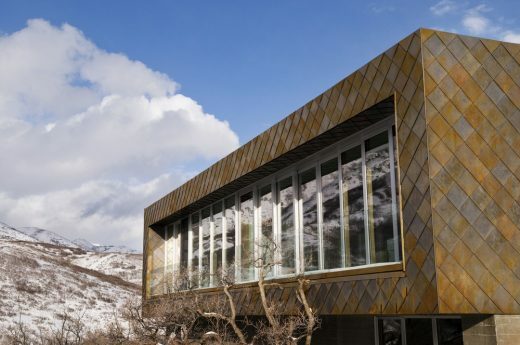 The project is located in a working class neighborhood near the Bingham Canyon Copper Mine, the deepest open pit mine in the world, and major employer in the area. Immigrants came to this part of Utah to work in the mines or on the railroad and stayed, living as minorities in a state dominated by another religion. 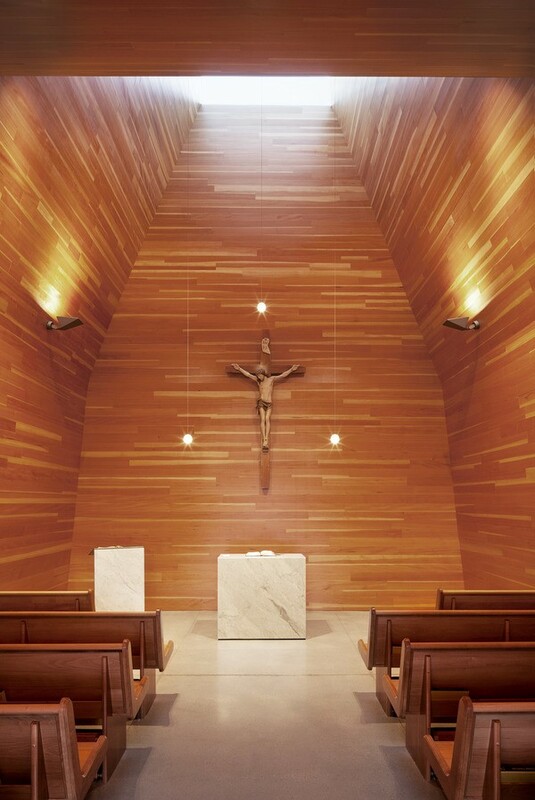 A modest church, now demol-ished, was built in 1965 on the site by the tradespeople of the parish. The design of the new church re-uses fundamental elements of the old structure, and incorporates new steel, copper and hand-crafted wood components to reference the parish’s mining and construction history. 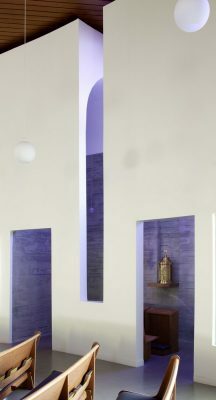 Drawing from this lineage, a palette of materials was selected that express the transformation of the raw material by the worker, revealing the craft and method of construction. 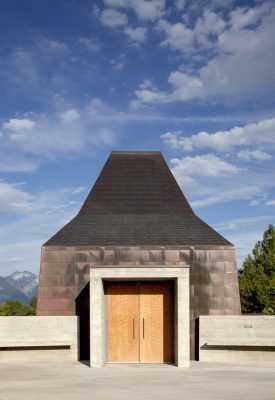 These materials include textural walls of board-formed concrete, constructed in the traditional method of stacking rough sawn lumber; a rainscreen of clear milled cedar; vertical grain fir boards and timbers used to create the altar reredos and interior of the Day Chapel; flat seam copper panels form the cladding for the Day Chapel and skylight structure over the altar; and glazing components requiring a highly crafted assembly of laminated glazing with color inter-layers, acid etched glazing, and clear glass insulated units with mullion-less corners. The design harkens back to the mining history of the early parish, and details ordinary materials to become extraordinary. The client came to the project with no preconceived ideas of what they wanted. 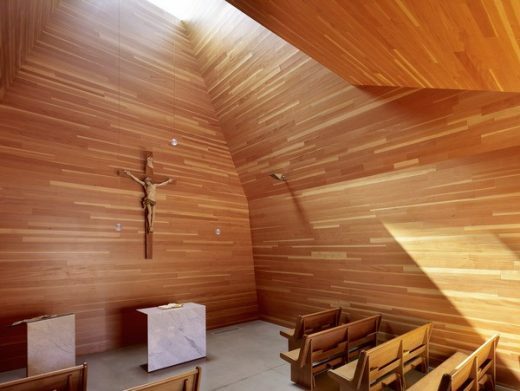 Our approach to the design of this or any sacred space is one where as long as the architecture reinforces the teachings of that denomination the forms and gestures of the architecture can (and should) be relevant to the epoch in which we live. 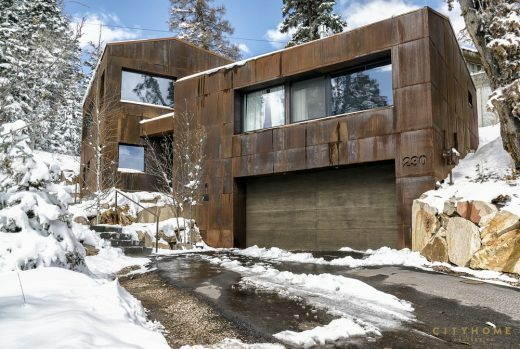 The client’s beliefs are the constant; the architecture that expresses them is the variable. 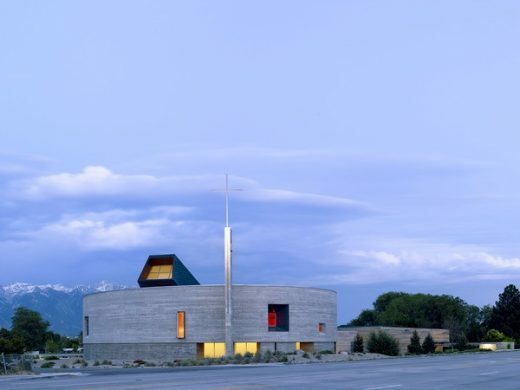 Of course none of this would have gained any traction without a good client and we were lucky enough to have a great one in Father Patrick Carley, the Parish Pastor. He is a true intellectual that not only appreciated the approach we took but loved to discuss it, explore and test it against church teachings along the way. He was a collaborator in the very truest sense of the word. When a group of people assemble on an open plane they naturally organize themselves into generally circular shapes. 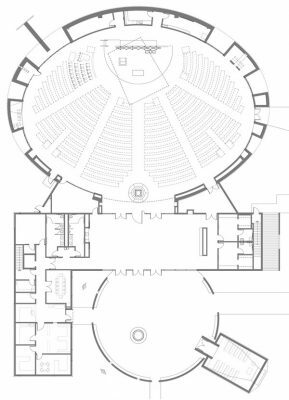 Through the design process for the sanctuary it became clear to us that some form of a circle provided an ideal shape for gathering. After working with the program and exploring a number of options to seat 800 people within a distance to the altar where they could still make out facial expressions of the pastor, the oval evolved as the best solution. 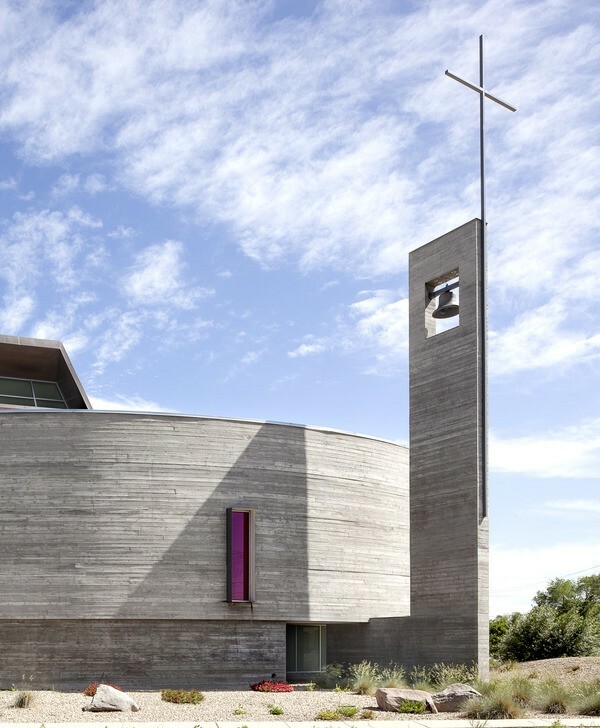 The form also has a rich historical precedent in sacred architecture, from the Pantheon to the Tempietto in Rome. 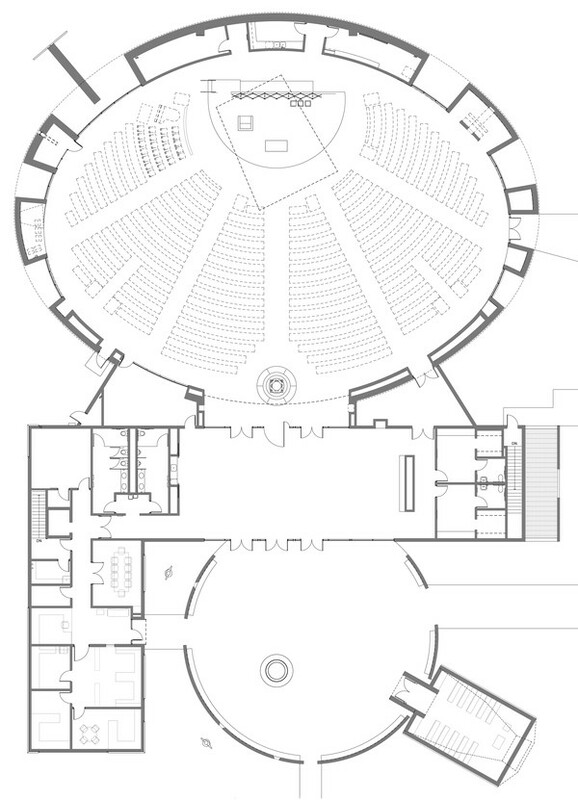 In following the precedents of this lineage at Saint Joseph the Worker, the rounded, thickened walls are programmed to contain small chapels, statuary and storage. Light is brought in through a sandblasted glazed band forming the base of the building, capped by a thick, light-colored volume punctuated by colored glass openings. This colored glass is a modern expression of the stained glass window.